Guaranteed Payouts Scam Review - It's Not Legit! Guaranteed Payouts Scam Review – It’s Not Legit! Guaranteed Payouts scam by Victor Lambert promises to make you wealthy with his automated binary trading system. However, he has some secrets hidden behind his bold claims. Read our Guaranteed Payouts review to find out the truth. Guaranteed Payouts scam (yes, it is a scam) found at guaranteedpayouts.net starts off their sales video with loads of empty promises and pure hypes. Victor Lambert, the alleged owner of Guaranteed Payouts system wants you to imagine days where you are already making $10,000 every single week. Victor claims that his system will make you wealthy, without you having to do anything at all! 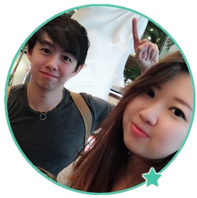 In fact, he claims that Guaranteed Payouts system is the first binary trading software to guarantee your future wealth. Is there really a fully automated system that makes you money? Unfortunately no, if there is, we’ll see loads of millionaires from binary trading alone. On the contrary, majority of binary options traders lose money. Even the renowned finance site, Forbes warns you against gambling on binary options. In fact, Guaranteed Payouts scam has a duplicate site called Guaranteed Outcome, which we have reviewed before. Duplicate sites are extremely common among online scams to reach more potential victims. Stay vigilant and don’t be fooled by the empty promises. How Does Binary Trading Work? Before we proceed with the review, I’ll briefly explain how binary trading works to make sure everyone is on the same page. If you already know how to trade binary options, you may skip this segment. Binary trading is gaining popularity in recent years due to its simplicity. With binary options, you don’t need to read financial news or analyze market movements. You only need to guess if the price of an asset will rise or fall after a short period of time, usually between 30 seconds to minutes. There can only be 2 outcomes – either you are right, or you are wrong. There is no middle ground (hence the name binary options). This is how it works – let’s say I feel that the exchange rate of EURUSD will fall 5 minutes for now, and I bet $50 on a 5-minutes contract. When the time is up, if the rate is indeed lower, I win a certain percentage of what I bet, usually between 60% to 80% ($30 to $40). But if I’m wrong, I lose the entire $50 that I bet. In practice, binary trading is not that different from gambling. Much like guessing the outcome of a coin toss, there’s no way to accurately predict the market movement in such a short period of time. In most cases, traders rely solely on pure luck and gut feelings. Even if you manage a 50% win rate, you’ll still lose money due to the uneven winning vs losing payouts of binary options. The difference in payouts is how binary options brokers make big money off the traders, and it’s also why majority of traders lose money. We do not recommend binary options if you want to make serious money online. There are simply better alternatives out there that are much more promising than trying to gamble your way to wealth. How Does Guaranteed Payouts Work? Is Guaranteed Payouts really free and guaranteed to make money? Back to Guaranteed Payouts scam. After feeding you some wild imaginations, Victor Lambert wants you to believe that the system he has created is a fully guaranteed profit system using his knowledge as a senior engineer in networks development. Long story short, Victor claims that he can intercept raw market data and analyze them a fraction of second earlier to predict the market movements before they actually happen, and take advantage of it. He calls it the timing anomaly. To be honest, this is one of the better crafted lie I’ve heard from binary trading software scams. Victor makes it sound very technical, and positions himself as an expert. I can see why people are falling for this scam based on his sales pitch. But when you think about it, it doesn’t make sense at all. The market movement is comprised of the decisions of thousands of traders, buying and selling all at the same time. Therefore, trade prices fluctuate dozens of times a second based on all these buy and sell instructions, making it impossible to “intercept raw data” and interpret it into a trading decision split second before market movement. The “raw data” is what moves the market. By the time you consolidate all the data and analyze them, the market has already made its move. There is no timing anomaly to exploit in the market. Despite giving you multiple guarantees and promises to make you rich, Victor Lambert and Guaranteed Payouts scam have some secrets hidden in their risk disclaimer. Simulated results do not represent actual trading. The trades have not been executed. Despite promising you guaranteed profits, it’s your own fault if you use Guaranteed Payouts and lose all your money. NO trades have been executed using Guaranteed Payouts automated system. All results shown are simulated. Fact #2 alone should be enough to alert you to steer clear of the scam. Why does Victor Lambert include such terms in the disclaimer? If you think it’s included as a fair warning for you, you are wrong. The sole purpose of these terms is to protect themselves from legal actions when you lose all your trading capitals. If he wanted to be upfront about the risks and the fact that no actual trading has been done using the system, he would’ve told you in the sales materials. Unfortunately, the truth of Guaranteed Payout scam can only be found in the risk disclaimers, and majority of victims don’t read it at all. You may wonder why Victor Lambert makes so much effort to promote Guaranteed Payouts just to give it away for free. Firstly, if you decide to sign up for Guaranteed Payouts system, you’ll need to register for a broker account through their sales page (which is an affiliate link). Victor and the scammers behind Guaranteed Payouts scam will earn a sum of referral fees as soon as you make your first deposit. 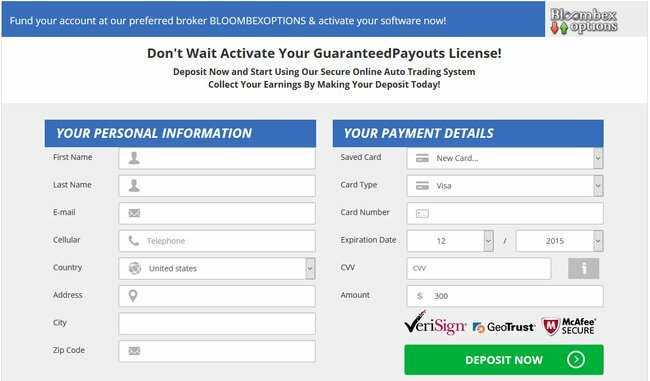 You need to deposit at least $300 with Bloombex Options before you can activate Guaranteed Payouts software. The minimum deposit may be different depending to the broker you’re assigned to. Keep in mind that you can only use the system with their affiliated brokers. Even if you already have an existing trading account with their recommended broker, you have to register for a brand new account using a different email address. Why? Because the scammers behind Guaranteed Payouts scam cannot earn their referral fees unless you sign up for a new account through their affiliate link. Not only that, Guaranteed Payouts will continue to make money off you over the long term. The team behind Guaranteed Payouts scam will earn commission for every trade that their system makes for you. To make things worse, since Guaranteed Payouts system runs completely on autopilot, they can dictate your trading frequency and the trade amounts. In short, they can decide how much commissions to earn off you, as long as you still have money in your trading account. Victor Lambert will profit regardless of whether you make or lose money, ALL ON YOUR EXPENSE. Is Guaranteed Payouts a Scam? YES, GUARANTEED PAYOUTS IS A SCAM. As we’ve said in the review earlier, we don’t recommend binary options trading as a way to make money online, at all. It’s not that different from gambling, and using an automated trading software is no different. You are essentially putting your hopes and entire investment in a piece of software that gambles on your behalf. Insiders Circle Scam Review – Don’t Get Cheated!